The feel of this dark copper picture frame is reminiscent of quality metals used at the height of the WW2 manufacturing era. Possible uses include framing aviation-themed vintage photos and posters, such as airplanes, bombers, and postal planes. Black and white or sepia-toned photos and vintage portraits might also be enhanced by the look of this picture frame. 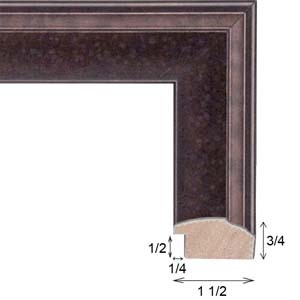 Consider this dark copper picture frame moulding for paintings, posters, and fine art prints that feature a warm maroon or gray color scheme. Possible matboard combinations acid-free archival double mat combinations such as Field Mouse 9597 and Coffee Bean 9842, or Bambi 9589 and Mocha Green 9826. 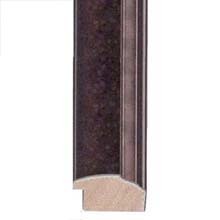 Finally, this dark copper picture frame might be enhanced by incorporating a fillet under the lip, such as our beaded F101 Imperial Black, or scooped F106 Black.